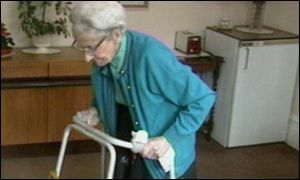 The care of elderly and sick people across England and Wales is falling largely on the shoulders of unpaid relatives, official statistics show. Results of the 2001 census show that 5.2 million people - one in ten of the entire population - cares for an elderly or sick relative. There is a north-south divide, with the north having more long-term ill and more unpaid carers than the south. The greatest number of carers per capita are found in Derbyshire, Durham, Merseyside and South Yorkshire. Hilary Carter, of the charity Help the Aged hoped the census figures would provide new impetus to improve the lot of carers. She said: "It's high time the contribution of over five million unpaid carers was recognised and support services put in place to help them. "Nearly two million of these carers are over the age of 60, who are looking after their husbands, wives, brothers and sisters at an age when their own health can be fragile." She said research by Help The Aged had found that many carers faced a bleak future. Many put in long hours of intensive caring on very low incomes, while suffering from a serious health condition themselves. More respite services were badly needed across the country, she said, to give people a break from the remitting nature of their responsibilities. Her views were echoed by a spokesperson for Age Concern, who said carers continued to be overlooked and undervalued. "It is appalling that at present, many caring for older relatives are expected to pay for local authority services like help with looking after children that can help make their very difficult job easier. "Support should be freely available to carers who need it, when they need it. As the latest census figures highlights, this hidden army provides essential support to thousands of people who need it every day." Nick Clarke, of the charity Crossroads - Caring for Carers, said carers saved the government £57 billion a year. "That's enough for a whole new national health service," he said. "I think people will be shocked by the number of carers shown in the census because a lot of people don't understand what a carer is and what they do, even though three in every five people will be a carer at some point in their lifetime." Paul Burstow MP, Liberal Democrat Spokesman on Older People said carers were the foundation on which the whole care system stood. Without them, he said, the whole system would face collapse and many local voluntary organisations would struggle. Mr Burstow accused Labour of failing to deliver on its manifesto commitment to create a fund to support carers. "With more and more councils cutting care services for people who have a paid 'carer', the burden is falling even more heavily on families," he said. "Many people have to give up full-time work in order to care for friends or relatives. This can force them closer to the poverty line. "Carers are all too often under valued, overlooked and overloaded. "Unless that changes, the government will lose their goodwill and entire communities will lose out." Mark Lever, chief executive WRVS, said the census figures highlighted the need to encourage more people to work as volunteers. He said: "Volunteering should be made more accessible to all people and we are working to make it easier to volunteer, when and where it suits people of all ages and groups. "We would also encourage local authorities to seriously consider their relationship with the voluntary sector, as a means to delivering a variety of value-added services. "Isolation, particularly for older people, is an increasing problem, which leads to poor health. "Social activity and interaction reduces that risk."